Susan and Andre Oliver began their home remodel with simply a napkin doodle and a great idea. Inspired by a home they saw in Dwell, the few opted to renovate their 1940s bungalow to provide it a contemporary layout and facade. 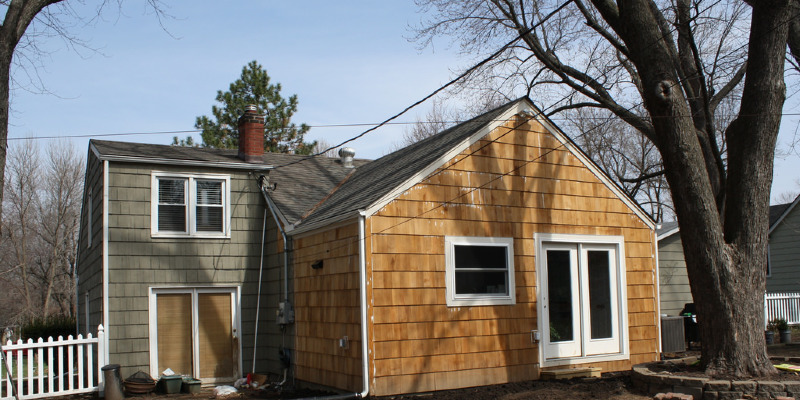 They commissioned Bayview Design to draw up a strategy and then changed a breezeway between the bungalow and the detached garage into a cube-shaped addition. As their vision became a reality, they chose to put their own creative marks on their home. “I enjoy the character of the old combined with the minimalist contemporary vibe,” says Susan. That’s interesting: During their 27-year union, Susan and Andre have utilized colors of white and black in each home they’ve lived in. Susan and Andre bought the home because of its great location. They loved the area in addition to the character of this well-built residence, but wanted to update it and offer it a minimalist look. Their white and black color palette begins at the front door. The block addition, visible to the right of the house (click picture to view whole view), combines the new and old structures into a single. “Sometimes the house tells the narrative itself, and you have to follow this, and that’s when the magic happens,” Susan says. The living area showcases the personal design philosophy of Susan. “Anchor a space with a block wall. Mix organic, natural substances with slick bits. Own less but buy quality,” she states. Four white cushioned chairs on a cowhide and a faux white bull head above the fireplace punctuate the black walls. Susan’s dad, a retired sheet metal worker, constructed a pan to maintain pebbles, which Susan utilized as a foundation for an ethanol firebox in the fireplace. A white lacquered desk, an old gilt mirror painted white and a chrome seat form a minimal home office at the same end of the living room. Paperwork is neatly stored in the white credenza on the opposite wall. The living area provides a sight line. Even though the kitchen has just one little window, lots of light in the new cube addition flows in. Susan and Andre wanted to leave this distance off the kitchen free and open for a spacious, contemporary feel. Their teenaged kids vetoed the idea and asked a desk and chairs for dining and mingling with friends. The Olivers eliminated a window in the home’s unique dining area — currently a breakfast room — to create a stairway to the new inclusion and bridge the detached garage to the home. The biggest design challenge in fitting the block addition to the present garage construction was leveling the floors, which took two different tradespeople. The square form of the 14-foot pool mimics the block. Susan and Andre functioned as their own contractors, hiring local tradespeople and even tapping the talents of Susan’s dad, who set up the heating and cooling systems and the exterior cladding. Andre did all the painting. The block addition boasts 18-foot ceilings and acts as a dining area in addition to a bridge in the original house to the family room. High windows bring in light and afford views of the backyard and pool. Three white leather chairs line all sides of a rustic dining table, and two white flooring vases hold easy branches for feel. The block also acts as a side entrance from the driveway. The grey cowhide and the two organic stools create beautiful, functional additions to the foyer. Bamboo flooring runs across the whole home to create all spaces flow smoothly. The former garage has been converted into this contemporary family room. The daybed-turned-coffee-table adds flexibility and flexibility. The antlers on the side table had been discovered by a friend in northern Ontario and echo the room’s clear view of the outdoors. Sculptural bottoms, loosely organized on the floor in front of a leaning wall mirror, add feel in the family room. Susan selects furniture and accessories carefully. And when she wants something fresh, her old bits typically visit family and friends. Susan used the hall space over the cellar stairs to install glass shelving for serving pieces. “Think outside the box. It takes creativity to choose an old house and make it fresh,” she states. The Olivers jazzed up the original wall tile in the bathroom with a contemporary mirror. A round sink set up in the original counter, which has been sanded, updates the midcentury style for the time being, but a entire bathroom renovation is to the schedule. A clean-lined square dining table and matching stool collection takes Susan and Andre’s love of contemporary design outside. They plan to complete a garden layout in the near future.